Ca. 1913. Anna Corona Onorati and her elder sister Maria Giuseppa Onorati, of Bono in Bleggio, Val Giudicarie, Trentino. Maria was my paternal grandmother. Article 1 of 4. Genealogist Lynn Serafinn discusses fundamentals of genetics, Y-chromosome, mitochondrial and autosomal DNA tests and pedigree collapses. Over the past few months on social media (especially on Facebook), I have been watching with interest a marked increase in conversations about DNA testing and its relevance to genealogy. This has been especially noticeable in groups exploring their northern Italian and/or Trentino ancestry. Amongst those of northern Italian descent, the ‘heated debates’ were mostly in response to AncestryDNA’s new algorithms for their ethnicity reports, which have suddenly – and seemingly inexplicable – relabelled many of us (including me) ‘French’. As I watch people’s reactions to their DNA test results and ethnicity reports (from ANY DNA testing service, not just Ancestry) I see they are frequently confused, sometimes disappointed, and occasionally upset. I have often added my own opinions and insights when I see these online conversations, but the nature of social media is that the impact of any kind of complex discussion is often fragmented. Unrealistic expectations about DNA testing (largely due to misleading media hype and advertising). Minimal or insufficient understanding of genetics in general. Insufficient genealogical research of their own ancestry. Misunderstanding the difference between ethnicity, nationality and cultural identity. Lack of knowledge of the history of their ancestral homelands. Lack of understanding of how ethnicity reports are created, and what the information actually MEANS. My purpose in writing this series is to help you become better informed on the subject, and not to discredit any of the DNA tests currently on the marketer or put readers off the idea of taking a DNA test. Quite the opposite, in fact: I believe that the more people of specific ancestries get tested, the more accurate and USEFUL the results will gradually become. I also believe we can make an impact on the future of research, when we combine DNA with meticulously-documented, traditional genealogy. 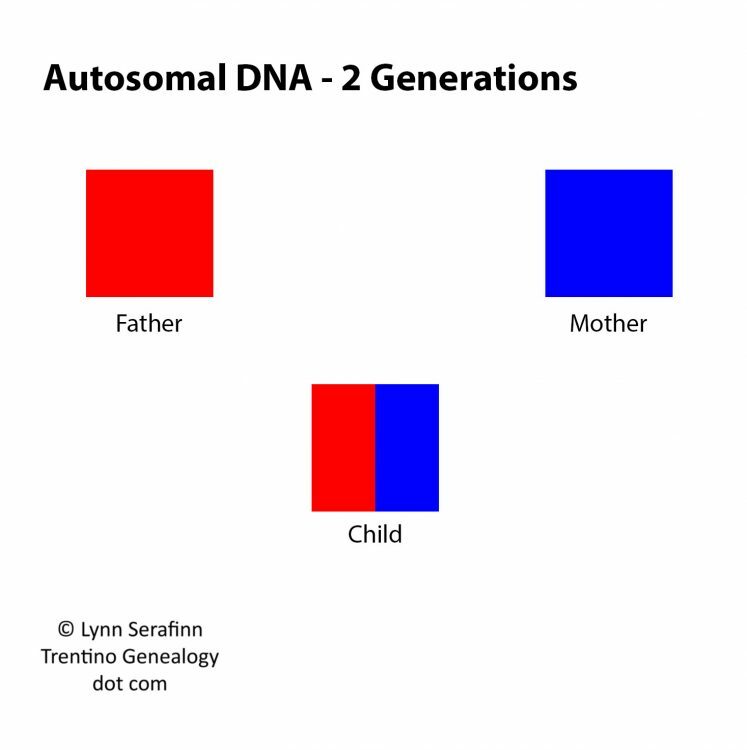 Article 1 (today’s article) will cover topics 1 and 2, where we will look at DNA tests and some basics about autosomal DNA. Article 2 in the series covers topic 3, looking at how DNA tests can often point us in a direction, but (usually) cannot give us specific answers about our ancestry or blood relations. Article 3 covers topics 4 and 5. This article will focus primarily on people of northern Italian descent, and more specifically those of us of Trentino descent, as our unique cultural identity plays a big role in how we might respond to DNA testing, both intellectually and emotionally. Finally, article 4 will focus solely on ethnicity reports, with examples from my own reports, so you can see how data can be interpreted (and misinterpreted) in context. NOTE: Be sure to subscribe to the Trentino Genealogy blog using the subscription form at the right so you can receive all the articles in the special series on DNA testing. After the series is complete, I will also be compiling the articles into a FREE downloadable PDF available for a limited time to all subscribers. If you are viewing on a mobile device and cannot see the form, you can subscribe by sending a blank email to trentinogenealogy@getresponse.net. DISCLAIMER: I am NOT a scientist or a geneticist. Nor am I an historian in the academic sense of the word. I am a genealogist and author specialising in the people of Trentino. I was a college teacher for many years, and I still teach workshops in Italian genealogy to various groups. Many years ago, I did post graduate work in social anthropology and world music. I have read a lot, observed a lot and researched a lot within the parameters of my work and my lifelong passion for social and cultural history. Genetics has always been a fascination of mine, as it plays a huge role in our understanding of our family histories, and our personal identities. I have done autosomal DNA testing through both AncestryDNA and 23AndMe, and I have also uploaded my raw data files to both GEDMatch and FamilyTreeDNA. Just this week, I also ordered autosomal and mtDNA tests from CRI Genetics (so I cannot comment on them in this article). Please bear my ‘mixed bag’ background in mind as you read this series. I would not wish to create yet more ‘unrealistic expectations’ for you by posing myself as an expert in genetics. I really am just like most people – learning as I go along. As a professional genealogist, I have subscriptions to just about every relevant genealogy website on the Internet. And when you have a lot of web subscriptions, you are also on a lot of mailing lists. So, it came as no surprise to me over the recent Christmas season that I received dozens of marketing emails from every genealogy site to which I subscribe, suggesting I buy their products as Christmas presents for friends and family members. And one of the number one ‘gifts’ being flogged this year by all the major sites this year was DNA testing kits. ETHNICITY: Marked by catch phrases like ‘discover your ancestors’ origins’ or ‘uncover your ethnic mix’. CONNECTION: Marked by catch phrases like ‘connect with relatives’, ‘discover long-lost family’ or ‘meet a distant cousin’. The trouble is, NEITHER of these promises is 100% honest, and both are somewhat misleading. Later in Article 3, when we look at ethnicity reports, we’ll see how and why ethnicity and ancestral origin reports are usually very ‘woolly’, imprecise, and often downright WRONG. And while the media (and marketing campaigns) love to focus on success stories of people who were reunited with parents, siblings and other close relations after doing a DNA test, for most people, the reality of connecting with blood relations through DNA testing is much more challenging, as we will also see later. Y-DNA – This test is specifically to trace your patrilineal ancestry (your father, his father, his father’s father, etc.). It is only available to men (as women don’t have a Y chromosome), but a female can explore this by asking her father, brother or a male cousin (he MUST be a son of her father’s brother) to get a Y-DNA test. This test is good if you are interested in tracing the history of a surname, for example. I have one client who is using Y-DNA testing to reconstruct the history of a specific Trentino family throughout the centuries. Mitochondrial (mtDNA) – This test is for tracing your matrilineal ancestry (your mother, her mother, her mother’s mother, etc.). Both men and women can take an mtDNA test, as we all inherit this from our mothers. Be aware that it does NOT tell you about all your female ancestors (i.e. it cannot tell you about your paternal grandmother, the mother of your maternal grandfather, etc. ), but only the direct line of females from your mother back in time. Autosomal – This is the most commonly chosen and widely available DNA test, and only one currently offered by companies like AncestryDNA and 23AndMe. You would choose this kind of DNA test you if you are interested in your more recent ethnicity (the last few hundred years) and/or connecting with living people who are biologically related to you. Autosomal tests are also used by companies (23AndMe is an example) to create health profiles, showing which genes you have that may indicate a higher risk of developing certain diseases or conditions, or sensitivity to certain medications. Autosomal tests can also be used for discovering inherited traits, such as eye colour, the ability to roll your tongue, etc. Autosomal DNA tests are available to both men and women. If your primary aim is to trace your patrilineal or matrilineal ancestry, there are currently only a few companies offering Y-DNA and/or mtDNA testing. FamilyTree DNA, National Geographic, CRI Genetics are the ones I know of, but there may be others. If your primary aim is to get a health profile, then you might look into 23AndMe. CRI Genetics also has a health report, but I haven’t had it done, so I cannot say how detailed it is. If your primary aim is to connect with living relatives (bearing in mind the caveats we’ll discuss later in this series), you would do best to go with the company with the biggest database of DNA testers, which is currently AncestryDNA. If you’re really serious about finding living relatives, you would do better to get tested through multiple companies. The bigger the ‘net’ the more likely to ‘make a catch’. If your primary aim is to get an ethnicity profile of your recent ancestry, pretty much all the testing companies will give this to you via autosomal DNA testing. However, as we’ll see later in this series, the results you will get are not always as precise as you might like. Also, as we will see, autosomal DNA (or at least our current understanding of it), by its very nature, cannot show details extending much further back than around 250 years (NOTE: that is an arbitrary figure I am gleaning from AncestryDNA’s ethnicity reports). Based on reviews, companies like FamilyTreeDNA and CRI Genetics seem to have a better reputation for accuracy and precision than Ancestry does, but I cannot yet vouch for either personally. ‘The 6 Best DNA Tests for Ancestry 2018 – Which Testing Kit Is Right for You?’ at https://www.myfamilydnatest.com/. Before dipping your toes into your chromosomes, I think it is important to understand a few basics about genetics in general. I don’t mean the scientific side so much as how it ‘works’ in our ancestral inheritance. To that end, I want to explain a little bit about autosomal DNA and how it is transmitted over time, as autosomal tests are the basis for the ethnicity reports people receive from most DNA testing services. Click on image to see it larger in a new window. While, in principle, this seems simple, in reality, it is more complex than it looks. Why? Because Father and Mother are not just ‘all red’ or ‘all blue’. Each of them has inherited 50% of their genes from their OWN parents. (Forgive any slight imprecision in the diagram; I did it by hand in Photoshop, and I’m not a graphic designer). 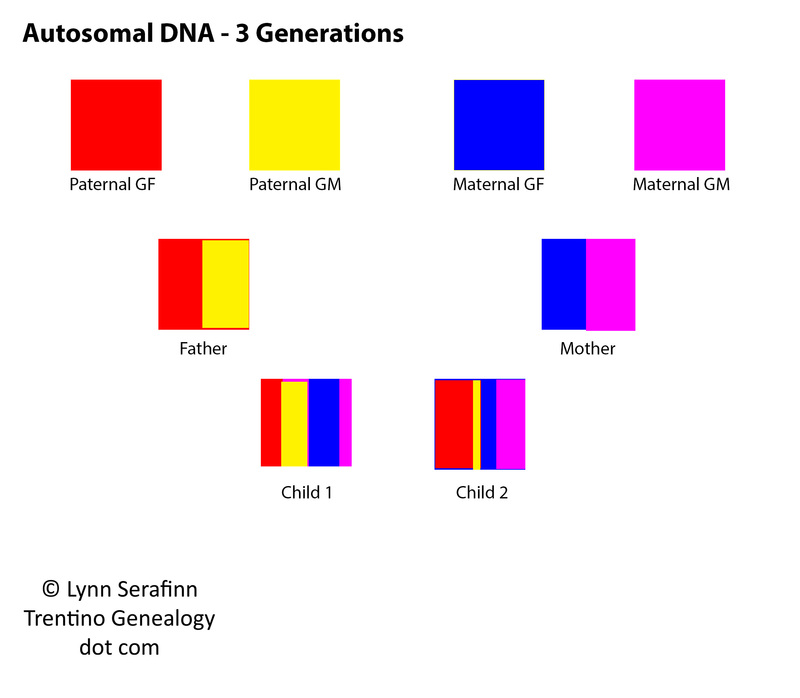 In the diagram above, we see three generations of autosomal DNA. Now, we see Father has inherited 50% of his DNA from his parents (red and yellow), and Mother has inherited 50% of her DNA from her parents (blue and purple). But look, now, at the children. Each child has inherited 50% of their DNA from each of their parents. HOWEVER, the percentage of DNA from each ‘colour’ (i.e. each grandparent) is NOT an exact 25%. They receive more from one grandparent, and less from the other, until it adds up to the full 50% from that parent. Note how Child 1 has a lot more yellow and blue DNA than Child 2, and Child 2 has a lot more red and purple DNA than Child 1. This is what makes siblings unique (except for identical twins, whose DNA are identical). From this diagram, we can see yet more diversity entering the ‘gene pool’. At each generation, children have inherited 50% of their DNA from their parents, but now (at least from Father and Mother down) we see how they continue to inherit DNA from their grandparents and the ancestors who came before in varying proportions. Now, when we look at the two children, we see even greater diversity between them. Child 2, for example, carries a lot more DNA from their father’s paternal grandmother (green) than his/her sibling does. Try to imagine, now, if I added another generation to this diagram…and then another, and another, ad infinitum. Not only would some of those colours become so narrow they would be hard to detect (and I would certainly have a rough time drawing them in Photoshop), but SOME of those colours might not appear in DNA tests at all. Siblings can sometimes receive slightly different ethnicity reports from the autosomal tests. It doesn’t mean they HAVE different ethnicities. It just means that one of them has genes that appear more in one ‘test group’ than the other (we’ll discuss test groups in the final part of this series). One sibling might have a DNA match on Ancestry, etc. which the other sibling does not share. It doesn’t mean they are NOT both related to the DNA match. It just means that the specific genes they inherited matched the specific genes the ‘match’ inherited. In fact, one sibling could inherit the DNA from an ancestor whose DNA is completely absent in their siblings’ DNA. Autosomal testing CANNOT really tell us our ‘ancient’ or ‘deep’ ancestry. Autosomal DNA is changing EVERY generation, whereas Y-DNA and mitochondrial DNA (which CAN tell us our ancient ancestry) are not. So, don’t go into autosomal testing expecting to discover very ancient ancestral roots. Scientists tell us we could indeed be a direct descendant of someone without having inherited ANY of that person’s DNA. The more distant our relation to an ancestor, the more likely this becomes. While that is the ‘official’ belief amongst scientists, I personally believe we carry DNA of each and EVERY one of our ancestors inside of us, from the beginning of time – even if only in an infinitesimally small quantity. I confess this is an utterly UN-scientific belief. But having researched so many ancestors for myself and so many others, I have come to believe it to be true, at what I might call a ‘spiritual’ level. If science cannot yet ‘detect’ the presences of all those ancestors in our genes, I believe it is more a measurement of the current technological limitations than an indication that ancient DNA simply ‘fades away’ over time. Again, this is simply my personal belief. But I suspect many others (especially genealogists) feel similarly. To finish our discussion on autosomal DNA, I feel it is important to touch upon the subject of ‘endogamy’, and how this related to both DNA testing and genealogy. ‘Endogamy’ refers to the practice of small, insular groups intermarrying over many generations – often over many centuries. Intermarriage within one’s own social group occurred amongst ALL human societies, pretty much until the beginning of the 20th century with the introduction of mass transportation. Having researched tens of thousands of families over the years, I would say that around 95% of the time, couples tended to marry within their own parish – and often within their own village/hamlet. Moreover, you will often see them intermarrying with the same families over the generations. Continual intermarriage within a closed community will ALWAYS lead to the inevitability of some couples marrying who were related by blood. The technical term for a blood relationship is ‘consanguinity’ (literally ‘with blood’). Many of us have heard stories about royal families intermarrying ‘too much’ (I’ll get to that in a minute), but the truth is consanguineous relationships between spouses occurs in ALL family trees, in all parts of the world, from the simple farmer up to kings and queens. And the further you go back in time, the more of these ‘consanguineous’ ancestors you will find in your tree. In fact, when you start to plot out all the families in a parish over a long period of time (as I am doing for the parish of Santa Croce del Bleggio), you will start to see that pretty much EVERYONE alive today who is descended from someone in that parish is related to pretty much everyone else – whether they realise it or not. Moreover, if you look back in time to, say, around 500 years ago, you will see that pretty much everyone who was alive THEN in that parish is your ancestor. There isn’t a person on earth who, does not have at least some ancestors who married someone who was related to them by blood. It doesn’t mean they were closely related. 4th cousins, for example, were not considered ‘close’ in terms of canonical (Church) law. And more distant relations than that, people didn’t even CONSIDER were ‘related’ to them at all. But while the Church and its parishioners might not consider 5th cousins and beyond to be ‘relatives’, from a genealogical perspective – and in terms of DNA – they most certainly are. Every time you have a pair of consanguineous ancestors, it creates something called a ‘pedigree collapse’. Normally, we expect the number of our ancestors to multiply by two at each generation, as we move back in time. But when there is a consanguineous relationship between a husband and wife, it means they share a common ancestor (or, more frequently, a pair of common ancestors). Thus, when we move backwards in time to the generation at which their common ancestors occur, there will be FEWER than double then number of ancestors (minus two, to be precise). In this diagram, Father’s mother and Mother’s father were brother and sister. 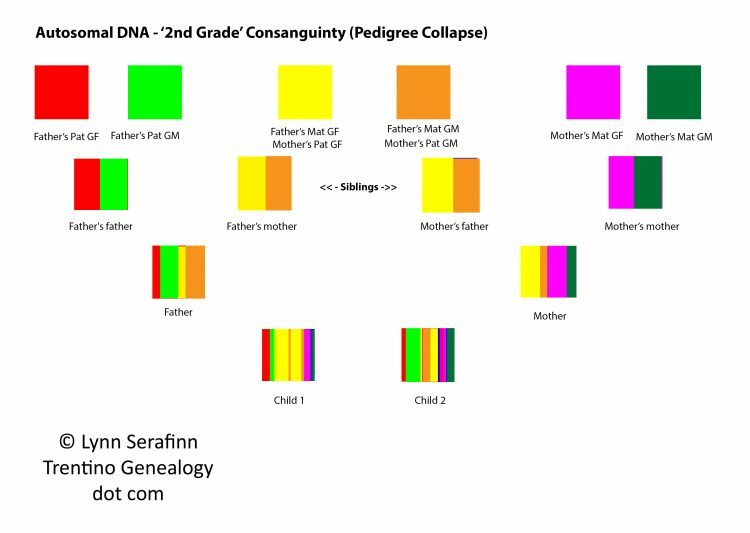 This means that Father and Mother above are actually 1st cousins (In reality, most consanguineous marriages are more distant than 1st cousins, but this was the simplest diagram I could draw to illustrate a pedigree collapse). 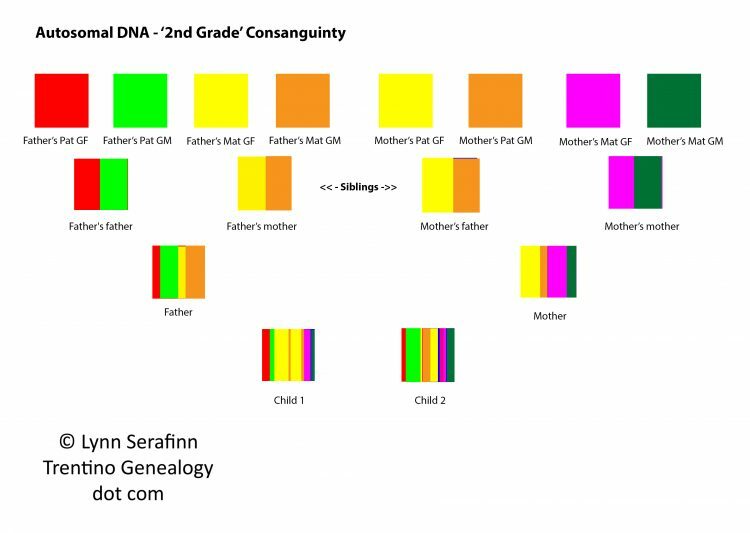 The Catholic church calls this ‘2nd grade consanguinity’ because the blood connections is found two generations back from the couple who are marrying (i.e. Father and Mother’s grandparents). 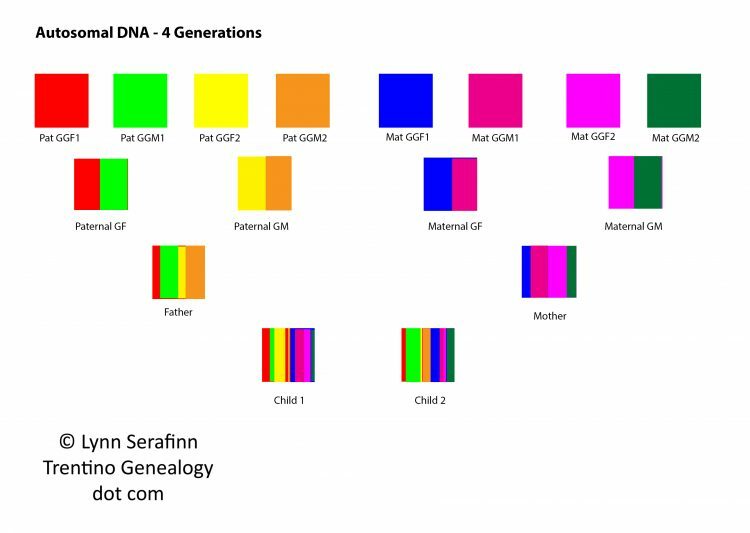 Look all the way at the top of the diagram, you will see that Father’s maternal grandparents are the SAME colours as mother’s paternal grandparents (yellow and brown). This is because they are the SAME couple. Instead of the expected eight grandparents for Mother and Father, we have only SIX. This is why we call it a ‘collapse’: instead of the number of your ancestors multiplying by two at every generation, whenever there is a consanguineous marriage, there will be fewer than the expected number of ancestors – two fewer if both ancestors are shared, and one fewer if only one of them is shared (e.g. if Father’s mother and Mother’s father we step-siblings instead of full siblings). Really, pedigree collapses are a simple matter of statistics: If we look back at the human population of the planet over the millennia, doubling our ancestors at every generation is mathematical impossibility. There simply weren’t enough people living on the planet for us to have two completely unrelated ancestors for every generation in our history. SIDE NOTE: In the future I will be publishing an article on this site discussing how to recognise consanguineous marriages and pedigree collapses in your family tree, and also how to USE these as clues to piecing together genealogical riddles in earlier generations. Have a look now at the two CHILDREN of the consanguineous couple in the diagram above. Do you notice anything different compared to the earlier diagram were there were eight great-grandparents? I’ve deliberately exaggerated the results for purpose of demonstration, but if you look closely at Child 1, you might notice he/she has TWO sets of yellow DNA. In fact, the amount of yellow in the diagram (and remember, it’s just my own drawing, and isn’t scientific) is close to 50% of the child’s DNA. This is because Child 1 just happened to get a double whammy of ‘yellow’ from both Mother and Father, via their shared ancestor. Child 1 and 2 are not just siblings; they are also 1st cousins, 1st removed. If Child 1 were to grow up and marry yet another close descendant (another 1st cousin, for example) of the ‘yellow’ great-grandfather, there is a strong chance that their children would inherit and even higher percentage of ‘yellow’ DNA, for the simple reason that there is that much less diversity in the genes to pass on to their descendants. If that DNA happened to contain genes associated for certain health conditions that were normally ‘recessive’, it would make that child more susceptible to developing those conditions. This is what happened to many of the European royal families, including Queen Victoria’s family and the Hapsburgs. Child 2’s genes appear to be a bit more evenly spread out, but there is always a chance that he/she has also inherited the recessive gene for a disease or serious health condition. So if this child marries another closely related descendant of the ‘yellow’ grandfather, there may be a higher risk that the condition will get ‘switched on’ in the next generation. Many people do DNA testing to find and connect with living relatives. Sites like Ancestry can sometimes give you lists of hundreds of ‘cousins’, with whom you share at least SOME DNA according to their tests. Sometimes these DNA matches show up as ‘probable’ 2nd, 3rd or 4th cousins. But others might show up as ‘3rd to distant cousins’ or something equally vague. One of the reasons for such vagueness is the presence of (possibly many) pedigree collapses. Because endogamy can cause your genes to become more ‘saturated’ (for lack of a better word) with the genes of certain ancestral lines, a cousin might show up who shares enough common genetic material to be your 3rd cousin in theory, but in fact is your 6th (or even more distant) cousin. Thus, if the two of you try to find your common ancestors at the 3rd cousin level (great-great-grandparents), you simply won’t find them, and are likely to become confused (and possibly doubtful about your own family tree) if you try to. Moreover, the more pedigree collapses each of you has in your ancestry, the more ‘off’ these estimates will be. The only way to SEE how you are connected is for both of you to have traced your family history – through genealogy, not DNA. My gut tells me (although this is just a HUNCH based on logic, and not any scientific evidence) that endogamy can also skew our ethnicity reports. In other words, if the genes for one ancestral line are disproportionately pronounced in our DNA due to pedigree collapses, would it not give the ‘appearance’ of us being ‘more’ of something than we actually are? For example, if we had inherited a lot of ‘yellow’, and ‘yellow’ was associated with a particular ethnic or geographic group in a tester’s DNA database, wouldn’t our ethnicity reports show us as being a high percentage of whatever that ethnicity happened to be – even if it weren’t the ethnic group to which we believed we belong? To get into the heart of such a ‘loaded’ question, we first need to get clear about what exactly ethnicity is – and what it is not – as well as how DNA testing sites ARRIVE at their ‘ethnicity estimates’. In that article, we will examine some of the misconceptions people have about DNA tests, how relationship estimates are formed to identify ‘DNA Matches’, and the many the challenges around identifying your connections with DNA matches. We’ll also look at the technique of ‘triangulation’, as well as how ‘endogamy’ can sometimes blur relationship estimates. I invite you to subscribe to the Trentino Genealogy blog, to make sure you receive all the articles in the special series on DNA testing, as well as all our future articles. After the series is complete, I will also be compiling all the articles into a FREE downloadable PDF available for a limited time to all subscribers. If you are viewing online you will find the subscription form on the right side at the top of your screen. If you are viewing on a mobile device and cannot see the form, you can subscribe by sending a blank email to trentinogenealogy@getresponse.net. P.S. My next trip to Trento will be in February and March 2019. 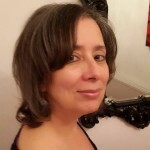 If are considering asking me to do some research for you while I am there, please first read my ‘Genealogy Services’ page, and then drop me a line using the Contact form on this site. Then, can set up a free 30-minute chat to discuss your project. Panoramic view of a section of Trento Monumental Cemetery (Cimitero Monumentale di Trento), Trento, Trentino-Alto Adige, Italy. 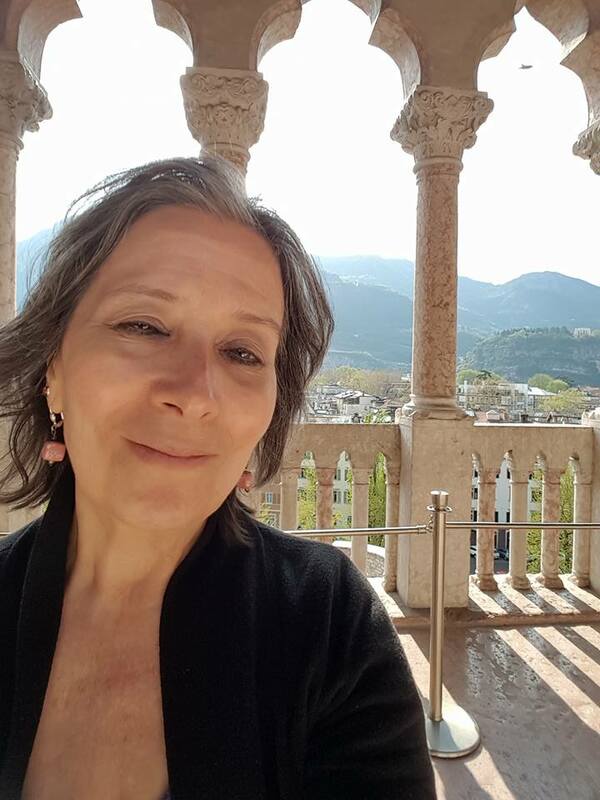 Trentino Genealogist Lynn Serafinn discusses cemeteries in Italy, and shares tips on how gravestones can help you discover more about your ancestors. Like so many other genealogists and family historians, I love walking through cemeteries. I don’t see them as morbid or spooky, as so much of our popular culture portrays them. I see them as profound expressions of love, admiration, community and social values. But cemeteries can also be rich sources of historical information, and catalysts that can help us discover many things we might not have known about our families. Sometimes, a random gravestone can turn out to belong to an ancestor, a distant cousin, or a family member of someone else you may not have met yet. I’ve observed that descendants of Italian immigrants often want to jump right into finding their ancestors in Italy before taking ample time to gather as much documentation as they can in their ‘adopted’ country. When we talk about Trentini descendants, those countries are typically either the US or somewhere in South America. I recently had a client who lived in England but, like me, had moved here from the US about 20 years ago. This client’s ancestors were not actually from Trentino, but from Genova. Since moving away from her birth place of Chicago, and since the passing away of her parents and other elders of the family, she had lost her connection to the family lore and had little information that could help us get to the point where we could start researching her family’s ancestor in the Italian records. When I took on the project, the first thing I wanted to do was fill in the blanks of her family AFTER they had emigrated from Italy. For that, one of the most valuable resources was Find-A-Grave, a website containing millions of memorials from cemeteries around the world, all submitted by volunteers. It is, if you will, a collection of ‘virtual’ cemeteries viewable to anyone with Internet access. Using Find-A-Grave immediately opened a floodgate of information for my client’s family tree. Not only did I find death dates, but many people are linked together, showing connections between spouses, children, siblings, etc. This information enabled me to construct entire families, which I later cross-checked with other online sources like Ancestry and Family Search. Additionally, some of the memorials contained obituaries from local newspapers, which gave me even more information – including information about when my client’s ancestors first came over from Genova. This led me to find immigration documents. 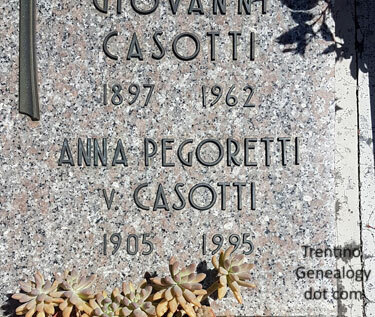 Using what I found in these virtual cemeteries, I was able to glean enough information about her family’s Italian origins to make me confident I could start tackling the Italian records. From there, things became much easier for me, and I quickly managed to take her family tree back to the mid-1700s with a day’s work. Click HERE to download a PDF list of cemeteries in North and South America known to have the graves of many Trentini (aka Tyrolean) immigrants, with links to their pages on Find-A-Grave. No sign-up or email address is required. But while using Find-A-Grave was a great success on this project, the site does have its limitations. All content on the site is provided solely by its users, so the data is as accurate or inaccurate as the people who enter it. TIP: If you see a mistake on a memorial in Find-A-Grave, you can (and should) send a suggested correction to the moderator of that page. Not all cemeteries are listed. TIP: You CAN add a cemetery if it is missing (and I encourage you to do so), but be sure to check it isn’t already listed under a slightly different name. Most cemeteries listed are in the United States. In fact, there are only a handful of cemeteries listed on Find-A-Grave from the province of Trento (CLICK HERE to see what they are). TIP: Again, I encourage you to add cemeteries you know in Trentino, but if you do, it is wise to enter them under their Italian name. Also, you MUST put ‘Provincia di Trento’ after the name of the comune, as that is how Find-A-Grave refers to and recognises locations in the province. They often lack detail. Frequently they only have the death date (sometimes only the year), without a date of birth (or at least the year). Even more rarely do they contain much information about who the person was in life, or about his/her relationship within the family. They are full of mistakes. Information on gravestones is supplied by a surviving member of the family. Family members – especially children of immigrants – can be inaccurate about dates, names, etc. Back in their ‘old country’, the family would have had access to the original documents via their local parish priest. But without that historic connection to their place of birth, the family has no such stream of information. People who emigrated at a young age (or were BORN in their adopted country) will often mishear, misunderstand, mix up or COMBINE two places, names or events. This results in a muddle of mis-information and false beliefs that will always be some variation on the truth. My cousins, aunts, uncles – even my own parents – were all prone to these kinds of false beliefs. 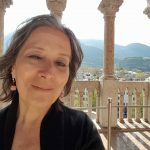 I had to do a LOT of unlearning, relearning and re-educating when I embarked on this genealogical journey. Equally (and possibly MORE) prone to errors are the obituaries that may have been published in local newspapers. The original information is provided to the newspaper by the surviving family who, as I’ve already said, can frequently get things wrong. Then the newspapers themselves can (and often DO) compound the errors, especially when it comes to the spelling of names and places unfamiliar to them. Birth, marriage and arrival dates will often be wrong, as well. Hopefully they at least get the death date right! Now, let’s cross the ocean and go back to the patria to have a look at cemeteries in Trentino (or anywhere in Italy). One of the first things people comment on when they visit an Italian cemetery for the first time is the practice of putting photographs of the deceased on the gravestones. This can be an exciting discovery for the family historian, as they can finally put faces to some of the names they have been researching. But once they get over that novelty, the next thing they notice – often with some amount of confusion and disappointment – is the ABSENCE of old gravestones. I mean, some of these parish churches go back over 700 years or more; surely we are going to find plenty of fascinating, ancient gravestones in their cemeteries, right? most gravestones are likely to be no older than about 80 years. This is because, in many European countries, a coffin is exhumed at some point after burial and the skeletal remains are removed from the grave and placed in an ossuary – typically a box, building, well or wall. Then, the same grave is used to bury someone more recently deceased. This removal of bones has nothing to do with religious practice, but with practical necessity: if everyone who ever died in the parish were put into a coffin and buried under their headstone forever, the space required for the dead would soon take over the land needed for the living. Just what ‘at some point’ means seems vary in different parts of Italy. I recently read an account where a person’s grandfather’s remains were exhumed only 10 years after he died (the writer expressed some understandable distress). In my father’s parish, however, they appear to wait a couple generations before transferring the bones. That way, the spouse and children of the deceased (and probably most of the people who once knew the deceased in life) are also likely to have passed away. Certainly, this is a more sensitive arrangement. SIDE STORY: Once when I was showing the underground crypt in Santa Croce to some American cousins, the lady who had unlocked the church for us found a small piece of (very old-looking) jawbone that had fallen out of the wall in a small alcove. She sheepishly whispered a request for us not to say anything about it to anyone, and she respectfully put the bone back into the wall. At the time, I thought she might have been worried teams of archaeologists would descend upon the church and tear it apart. Later, I realised this was probably the site of an ancient ossuary, and she may have wished to avoid upsetting anyone. The crypt itself is at least 1,000 years old, and it was built on the site of an older, Longobard (Lombard) church. In larger parishes with many frazioni (hamlets) spread out over a wide area, you will often find small satellite churches serving these communities, some of which might have cemeteries of their own. In these cemeteries, you might get lucky and find a few older graves, especially if the family was prominent in that frazione. 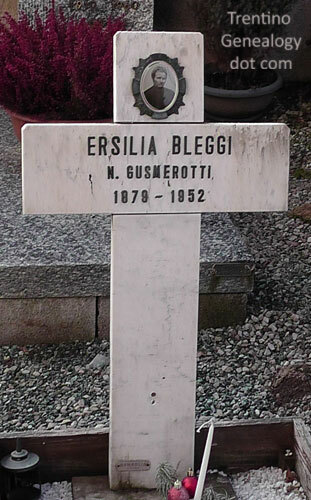 For example, when I first went to the main parish cemetery for Santa Croce del Bleggio, I was disappointed not to find the graves of my Serafini great-grandparents, who died in the 1930s. 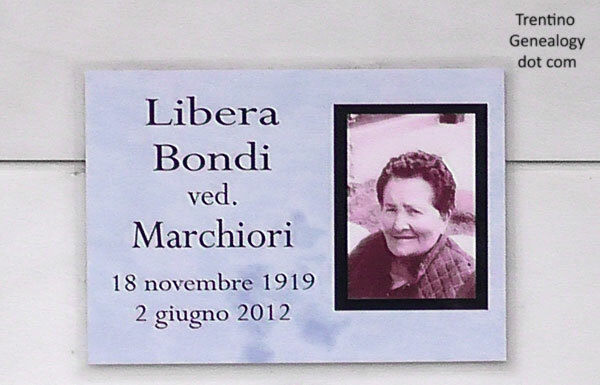 But when I visited the cemetery adjacent the little church of San Felice in the frazione of Bono, where my grandmother’s Onorati family had lived for many centuries, I found the graves of my Onorati great-grandparents who had died earlier, in the 1920s. I believe the reason may be partially due to the Onoratis’ historical prominence in Bono; but the frazione is also tiny, and the cemetery is not nearly as crowded as the main parish cemetery. Some frazioni cemeteries are even larger than the main parish cemetery. Remember also that married women are most likely buried in the parish (or frazione) in which they lived with their husband. Unmarried women will most likely be buried in the parish (or frazione) in which they were raised. So, when you make your trip to Trentino, be sure to ask whether there is more than one cemetery in the parish. You might discover your ancestors in a place different from where you had expected. Identifying women on gravestones can often be more challenging than identifying men, as the way they appear will vary according to culture. For example, because women in the US, Britain and many other countries take the surname of their husband when they marry, they are nearly always referred to by their married names on their headstones when they die in their adopted homeland. In such a scenario, a woman’s gravestone might not be very useful for research, as it doesn’t offer much information about her origins. In contrast, Italian women retain their maiden names throughout life, even if they have been married for decades. Thus, MOST of the time, a gravestone will give some sort of reference to both her maiden and married name. There are three common conventions for recording a woman’s name on a headstone. Let’s look at each in turn. Typically, if a woman is buried in the same plot as her married husband and/or children, she will be referred to by her married name, BUT it will usually have the word ‘nata’ (or its abbreviation ‘N.’), which means ‘born’ (feminine gender). Here is an example from the frazione of Balbido in Santa Croce del Bleggio. 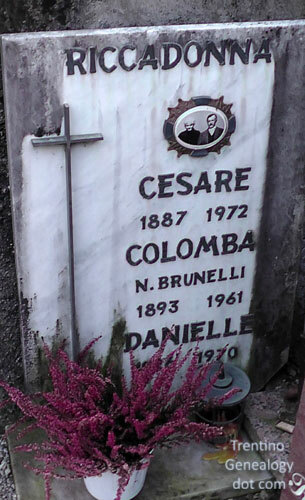 The family name is Riccadonna, and you can tell from the photo and the layout of the stone that we are looking at the grave of a husband (Cesare), wife (Colomba) and one of their children (a son named Danielle, born in 1926, although the date is hard to see behind the flowers). Below Colomba’s name it says ‘N. Brunelli’ (nata Brunelli); thus, her birth name is Colomba Brunelli. Sometimes a woman’s birth name is given first, followed by her married surname prefixed by the word ‘in’. I have noticed this is most frequently used if the woman happened to be buried in the grave or tomb of her birth family (which could be in a different parish or frazione from her husband’s). VIDEO: See a video I took at the Cimitero Monumentale di Trento when I visited it in July 2018 (second on page). If a woman’s husband predeceased her, she will be referred to as his widow (vedova in Italian) in records and on her headstone. In this case, the stone will give her birth name, followed by the word ‘vedova’, ‘ved.’ or simply ‘v.’, which is then followed by her late husband’s surname. The question, of course, is WHO is the late Mr. Marchiori? We’ll come back to that question in a moment. None of the people whose gravestones I shared above are ancestors of mine. In fact, I took those photos out of a sense of curiosity rather than any specific investigative motive. But as a genealogist, my natural curiosity often leads me to seek out details about a person I find on a gravestone, even if I don’t know them. When I do, I often discover I am connected to them in some unexpected way. 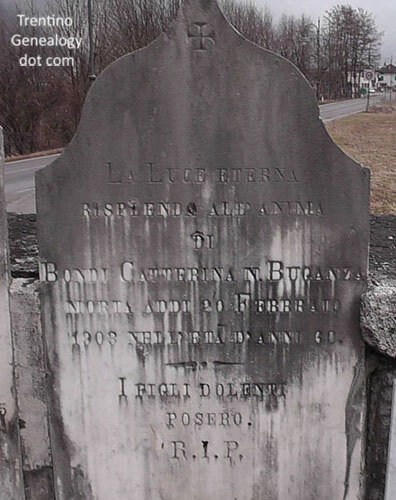 Let’s take Colomba Riccadonna, born Brunelli, from the first gravestone I showed you above. The stone says she was born in 1893. 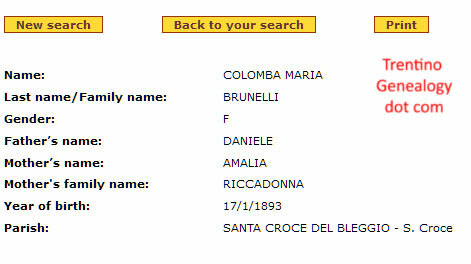 1893 baptismal record listing for Colomba Maria Brunelli, from Nati in Trentino online database. I also used Nati in Trentino to try to identify Cesare, but there were actually two Cesares born in 1887, so I needed to find their marriage record to learn which one he was. I also searched for additional children for the couple and found a daughter born in 1923. They probably had other children, but the online database doesn’t go past 1923. When I entered Colomba into my tree, I discovered she was a distant cousin (7th cousin 1X removed). Not exactly a close relation, but you never know what such a connection might lead to later. ERSILIA was my 7th cousin 2X removed. GIUSTINA was my 3rd cousin 2X removed. CATTERINA was the great-grandmother of one of my clients. I hadn’t planned it that way; I just happened to have taken the photo when I was in Saone on a previous trip. Las month, when I was working on that client’s tree, I looked through my photo archive and discovered I had a picture of her great-grandmother’s grave. You never really know who or what you will discover when you start taking photos of random gravestones. I could never have predicted a photo I took a couple of years ago would end up being the great-grandmother of one of my future clients. But my client was thrilled to see the photo, as she’s never been to Saone, and this took her closer to her roots. The primary surname on this stone is MARCHIORI, and the patriarch is Modesto, on the left. To his right, we see ‘Elisabetta Marchiori, born Bondi’. Looking at the dates, we can ASSUME Elisabetta was Modesto’s wife. Of course, we would need to verify that with documentation (I already have, and they were indeed husband and wife). 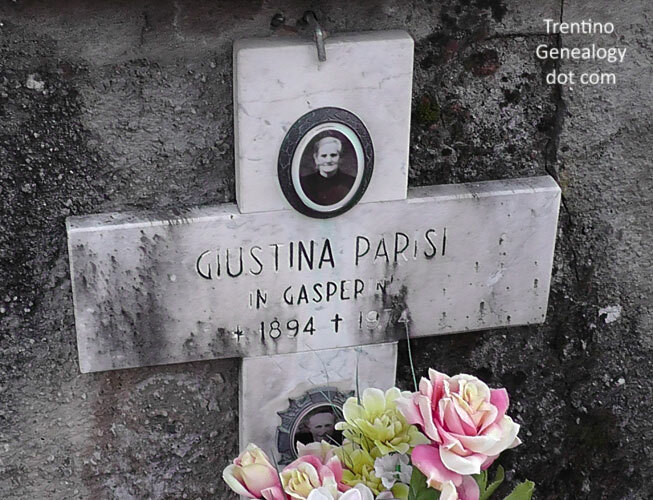 Moving down the stone, we come to Giuseppe (born 1910) and Antonio (born 1912), with no surname mentioned. The omission of a surname implies they share the same family surname, i.e. Marchiori. Again, looking at the dates, we might guess that Giuseppe and Antonio were the sons of Modesto and Elisabetta. To verify this theory, I looked them up on Nati in Trentino. Sure enough, I found them listed amongst Modesto’s and Elisabetta’s children, along with several other siblings. But now we have the question of the two women: Emilia (born Biancotto) and Libera (born Bondi). We can assume they were probably married to these two sons. But who was married to whom? 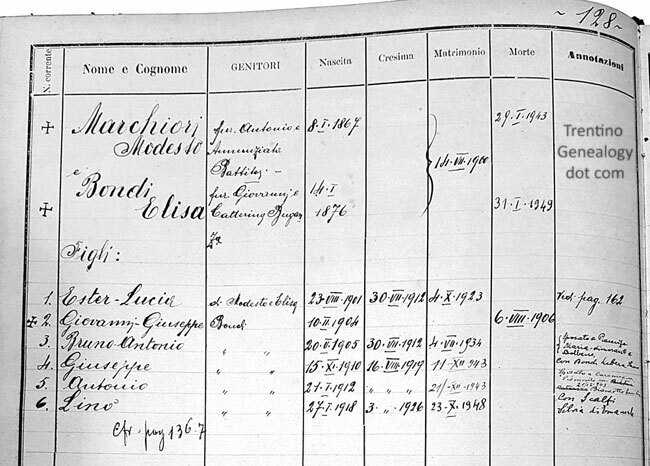 Anagraph for the family of Modesto Marchiori (born 1867), Saone parish records, Archivio Diocesano di Trento, Trento, Trentino-Alto Adige, Italy. Anagraphs (called ‘Stato delle Anime’, or ‘State of Souls’ when they appear in the parish records) are records of family groups and contain a wealth of information, including dates of birth, confirmation, marriage and death. They can also include the names of the spouses in the annotations column at the right. In most places, anagraphs were started in the mid to late 19th century. The various comuni also started recording them in the 19th century, maintaining them at the registry of anagraphs; but so far, I have only dealt with those kept by the church. In the ‘Annotazioni’ (annotations) column in the anagraph above, the priest has recorded that Giuseppe was married to Libera Bondi and Antonio was married to Emilia Biancotto, with dates of their respective marriages (I know it’s difficult to read here, but I have a larger, full-colour image on my computer that shows it more clearly). So, while the gravestone didn’t give us all the information we needed, it certainly pointed us in the right direction, giving us clues about what we should look for next. Thus, it was a crucial part of our research. As it turns out, this family group are ALSO related to my afore-mentioned client, as Elisabetta (Elisa) Bondi was the daughter of her great-grandmother Catterina Buganza, and sister of her grandfather. In other words, Elisa was her great-aunt. Tracing this family helped me identify many of her close cousins. If you analyse every aspect of a gravestone, you will often find it contains a lot more information than dates alone. Sometimes you can discover a person’s occupation, gain insight into their personal character, or get a feeling for their relationship with their family and community. 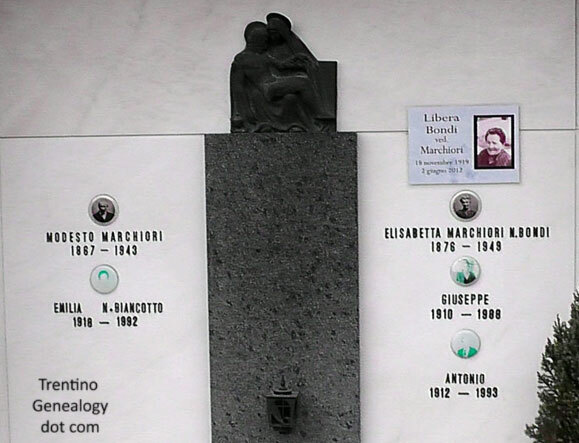 This photo is of the ossuary memorial for a man named Secondo Bertoldi. The stone tells us he was born in Lavarone on 20 Aug 1872 and died in Trento on 20 Feb 1933 (Roman numerals are used for the months). But it also tells us he was a chemist/pharmacist (here in England, pharmacists are also called chemists, but the term is not generally used in the US). Additionally, it says he was a ‘fervent patriot’, and that he lived his life in a loving way and by doing good. 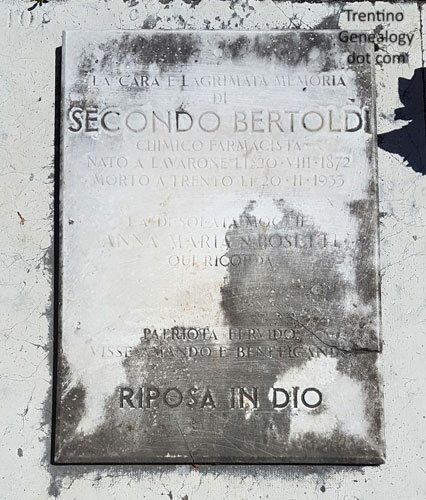 It also says that his wife, Anna Maria Bosetti, arranged for this stone to be laid as a ‘loving and tearful memory’ of Secondo. All these words give us a much richer picture of who Secondo was than what we might have learned from documents alone. The stone merely says ‘Vitti Sisters’, and then gives their first names and years of birth/death. 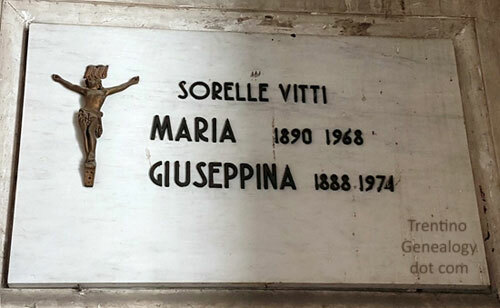 A quick search on Nati in Trentino told me that Giuseppina (born 27 Aug 1888) and her sister Maria (born 15 Oct 1890) were both born in the city of Trento in the parish of Santi Pietro e Paolo (Saints Peter and Paul), and were the only two daughters of Andrea Vitti and Santa Tommasi. The sisters also had two brothers, but I don’t know anything other than their dates of birth. Apart from this, I know nothing at all about this family. But the fact that these two sisters – both of advanced age (78 and 86) – were laid to rest in the same grave AND they were referred to by their birth names leads me to theorise that neither sister married. It also leads me to think they were probably very close throughout their lives. While these are just my own guesses based solely on what I am seeing in the stone, these guesses might help point me in the right direction if I were to research this family in depth. Whether you are planning a visit to a local cemetery, or you are hoping to visit some cemeteries when you are in Trentino, be sure to bring a camera and photograph as many graves as you can, even if you have no clue WHO the people are. If the cemetery is very large – or if the thought of dealing with all those photos is a bit overwhelming – focus on photographing stones containing one or two specific surnames. And remember, when in Trentino, don’t just visit the main parish cemetery; ask if there are other cemeteries in the frazioni where your ancestors may have lived. Don’t worry about trying to make sense of who is who when you are taking your photos. That will only slow you down and make it less enjoyable. Look at your trip as a kind of ‘treasure hunt’ where your mission is to get as many good photos as you can. Be sure to get the WHOLE stone in your photo, so you can see all the words in context. They may not mean anything to you now, but they may mean something important later. as the remains and headstone for that person may soon be moved – or removed altogether. 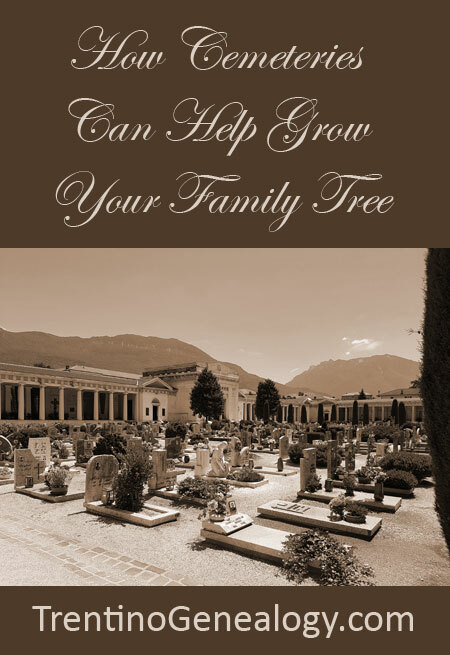 Consider SHARING your images on your tree on Ancestry, as well as on Find-A-Grave. That way, you are not only helping yourself, but also making it easier for OTHER Trentini descendants to find the graves of their own family members. Your photo might mean the world to a complete stranger many years from now. BRIGHT IDEA: Perhaps we could create a ‘virtual party’ for the purpose of creating all the Trentini cemeteries on Find-A-Grave and entering our family’s memorials on there. We could use our Trentino Genealogy Facebook group to coordinate it. What do you think? I hope this article has helped you understand more about interpreting gravestones in Trentino, and has also inspired you to go out and start recording as many Trentino graves as you can – as soon as possible, before they disappear. P.S. My next trip to Trento is from 21 Oct 2018 to 15 Nov 2018.